Too bad that project is on hold. Any decent designer ought to have a handful of projects on hold! If I am not mistaken, I can see that you are Markus, the author of the current -m versions along with Karl-Heinz's -k ones! Firstly, let me congratulate you both for your efforts. I am familiar with oversampling and the decimation/averaging method of achieving higher resolutions as well as with the (random) noise injection method of a few LSBs into the under test signal, in order to assist oversampling. I also agree in that the standard 8-bit AVR ADC might be insufficient for any faster or any better accuracy results than those already achieved, since its non-linearity and gain errors put a ceiling to the final acquisition product maximum resolution accuracy. Now, it is a fact that even 1 LSB offset error narrows down the usable range of the 1024 discrete steps of the 10-bit ADC available output by one unit, affecting the final product value by introducing a minor scaling error. Is this the reason why the ADC results offset corrections were overruled? 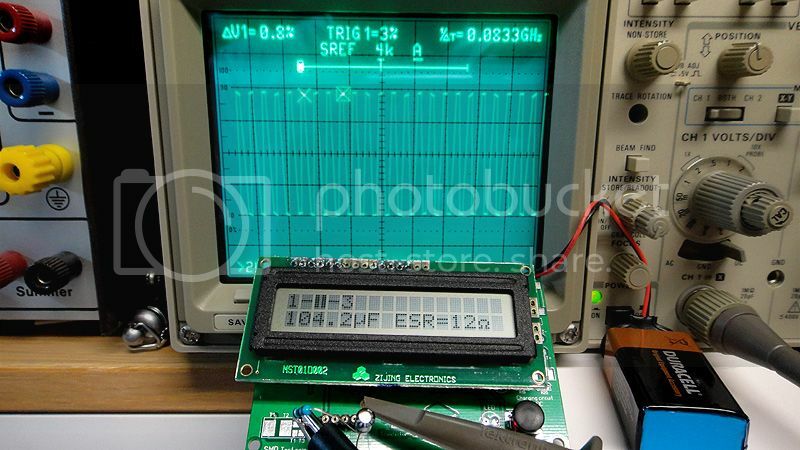 Because, during the auto-calibration procedure, the offset error can be measured, compensated, and it can be used for the calculation of the usable ADC range; and all these additional ADC parameters can be also stored in EEPROM along with the other device parameters. I really like your idea, Richard! Changing dynamically the voltage reference by the use of the available PWM hardware might breathe new life into this already impressive project, by expanding dramatically the device's dynamic range. Of course, any fancy hardware changes will be a problem to the existing standard devices, which will not be able to make use of any possible new features without any PCB/hardware (heavy) modifications. Other than that, and based on the latest Component Tester schematics, any of the PC5:PC3 spare I/O lines could be exchanged with PB1 (or PB2) in order to take advantage of the OC1A (or the OC1B) 16-bit PWM outputs (with a sub-millivolt resolution! ); another ADC line of the spare ones (PC6:PC3) is needed to be driven by the configurable PWM voltage reference generated (through an additional RC low-pass filter). The external crystal should not be dropped (in order to utilise the PB7:PB6 I/O lines) because it would impair the time-based measurements accuracy. The only drawback I can see is the additional time needed (in the order of a couple of hundreds of milliseconds) for the PWM output RC filter to reach its final output before it can be used as a stable voltage reference. As a bonus, the very low level ripple induced by the PWM stage will assist oversampling. Unfortunately, the m168/m328 ADC does not support differential channels input, nor the relatively high impedance PWM stage RC filter output can drive directly the 32 Kohm AREF input line without any external buffering; but this error can be measured and compensated if this configuration is chosen to be used. I would prefer an SPI/I2C driven, precision DAC. Don't know if the pin count allows it. Maybe shared with the LCD. I believe they're opening up the challenge not to touch the hardware design, all will be done purely at software to improve this circuit. They will have toy use capacitors and resistor for the PWM filter. Just joking! A DAC could be just bodged to the main pcb. I might give it a try my self. Karl-Heinz tested a lot of ATmegas (same and different models) and none showed any large offset for the internal 10 bit ADC. Surely, the offset has an impact on the result but it's quite low based on the findings. The ADC measurements are done in a tiered way. The first measurement uses 5V as reference voltage and if the result is below the internal bandgap reference (about 1.1V for the more powerful ATmegas) the measurement is repeated using the bandgap reference. The accuracy of that bandgap reference (about 10%) causes much more trouble than a low ADC offset. Of course the voltage of the bandgap reference is measured, but using 5V as reference for that doesn't give a high accuracy either. Karl-Heinz' firmware version supports an optional external voltage reference of 2.5V to improve the accuracy. At first i thought it was a clone of the Peak Electronic testers but then I think it's something different and with more functions than any of their devices taken alone. Markus, great to see you in this forum. I just find the efforts of you and Karl-Heinz inspiring. You have used the Atmega processors in ways I never even considered, and it is exciting. I do understand that your project is all about very simple hardware, and making improvements through firmware, but you may be interested in the work George (A Hellene) and I did on the Atmega PWM as a voltage divider/reference. To summarize, what we found was that you can get extremely impressive precision and resolution using the 8 bit PWM - the performance was a long way superior to the 16 bit PWM. This means that the processor can output two precision voltages or divider ratios at resolutions up to 24 bit with less then a second settling time with a few lines of code. Hardware is as little as three 5% resistors and three multilayer ceramic capacitors per reference output. One of the things I found was that for precision circuits, use the full swing clock for a ceramic resonator, not the low power one. The full swing clock is noise insensitive and the jitter appears to be less then 1nS even on a breadboard. The lower power clock has more of jitter and it is very sensitive to modulation from nearby electrical noise - particularly LCD displays. Going from a low power clock to the high power clock probably improved the PWM linearity by a factor of over 10 on a breadboard test. I didn't test to see if a crystal instead of a ceramic resonator has the same issues, but there may well be some degradation. It is a long thread unfortunately. The idea started from the need for a very high resolution and very cheap reference source for voltage and current for a low cost power supply. I wanted to be able to monotonically adjust voltage down to about 10uV steps so I could use the supply for tasks like providing the DC voltage input to a Fluke 540B RMS calibrator. For that an adjustable DC source is needed that is stable and can be adjusted down to the 0.001% level resolution. Accuracy wasn't important, but I was shocked to how good the Atmega PWM was. Most modern digital power supplies do not have the resolution. 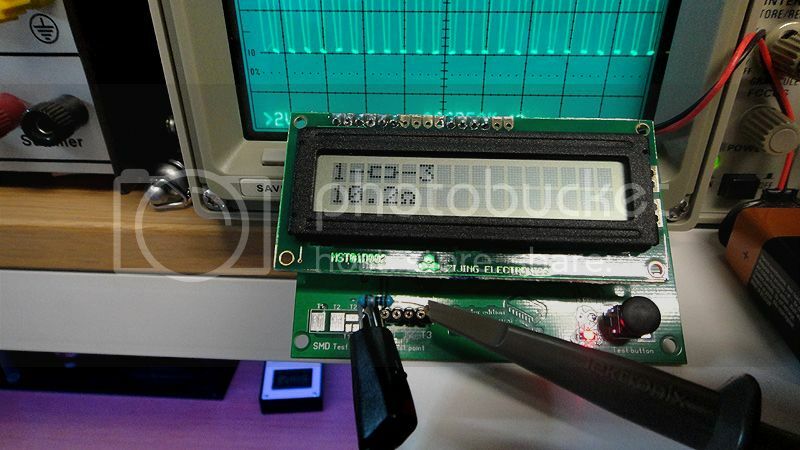 Thanks to you, I now I find it is not the only magic that you can do with an Atmega processor. When I stumbled on this Chinese-made gizmo, I had no idea of the history and background behind it. Reading all of the above (and the documentation) I realize now what a truly impressive project this is and I thank you for all your efforts. Beyond the ingenuity of squeezing so much out of a processor that wasn't purpose-built for the task, the end result is a very useful tool in and of itself. I will have to explore further the two enhancements (cap discharge and zener diode) that you mention. Maybe a kit with the leads, shielded bannana plugs and clips included? And a separate battery compartment. I would definitely want a separate battery compartment. What other features would you look for and how much would something like that be worth to you? Torch, thanks for the heads up, I would like to build one myself, it is fun for me to do so. Right now I ordered some parts for my DMMCheck, I mailed with the maker (Doug) to have some ideas so I don’t make something which makes the DMMCheck go out spec. That's also a great project! The idea to generate a MCU driven adjustable voltage reference to optimize accuracy and resolution for low voltages is compelling. Much better than the internal bandgap reference. I received my tester today, I measured couple resistors and capacitors and this is little fun device to play with. I am not sure how the accuracy is but known values looks okay, and that is not that important at this price. Now I need some time to make a case for it. I read elsewhere on the forums that this doesnt support in circuit esr readings. Have you tried? I am not after a super accurate measurement just to tell if a cap is bad. Once i have done enough repairs i hope to by a proper tester although i just cant justify it at this stage. Spawn, please, share the scope's shot on the measuring signals at the probe from open connection to different DUTs. No - you would definitely be much better off using a meter designed for ESR measuring at 100kHz. 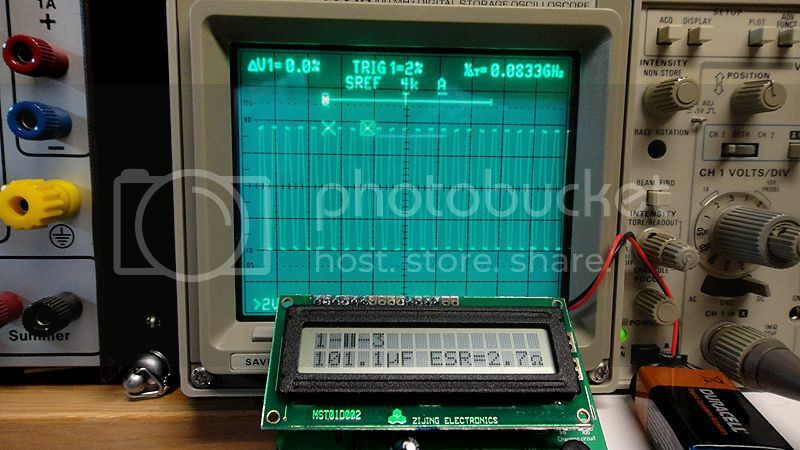 You cannot even force the ESR to tests the attached device as a capacitor - it makes a best guess, and who knows what guess it will come up with in an in-circuit test. It also has zero protection and trying to add protection any interfere with other device readings. A good ESR meter will hopefully have some ability to survive some residual charge on a capacitor. No - you would definitely be much better off using a meter designed for ESR measuring at 100kHz. Why Richard ? Is that because of common power caps are rated at 100Khz ? or other reasons ? Because at 100kHz, the ESR resistance is much larger then the impedance due to the capacitance so it is easy to measure the ESR accurately. For example a 100uF cap has 16 milliohms impedance due to the capacitance. A 2000uF cap has less then 1 milliohm due to the capacitance and that is about the resolution limit of the best in-circuit esr meters. It is really easy to see a 20 milliohm esr when it is in series with 1 milliohm capacitive impedance. Ok, a bit offtopic, but this times about the "circuit design", is there any significant "challenge" to design/make the LCR measurement circuit that capable of max 100KHz vs 10KHz ? Or other non technical concerns maybe ? Cause at commercial LCR meters, the price difference is quite significant, why is that ? It is simply that there are many sources of error, particularly at 100kHz, the designers have to track each one down and see what they can do to reduce or eliminate that source of error. Sometimes they can find a way for the software to measure the internal error, and eliminate it from the result through calculation. Sometimes it just means lots of PCB layout revisions. Sometimes very small changes in design make a big improvement in accuracy. It can mean trying just about every analog switch on the market to find the one that performs the best. So the difference between an top Agilent meter, and a cheap no-name Chinese one is the amount of time the designers spend polishing the design. The cheap one is probably a close copy of a chipsets manufacturer's sample circuit, or closely based on another company's design - but without the knowledge that that other company had in optimizing the performance. Even though a final circuit can look reasonably simple, the chances of one of us designing a meter to equal an Agilent one on a first attempt is pretty low. Then again, you never know if you don't try. Got it, great knowledge learned here ! Thanks again ! 1st is open connection, no DUT, straight from the test probes, 2nd a known low esr cap, and last that low esr cap series with a resistor or a known high esr cap. Really appreciate and thanks for trouble. With a frequency of 680Hz, this device is limited in it's ability to test low value caps even out of circuit. I think it's OK for most electrolytic caps though. Provided it picks up the DUT as a cap, and provided the cap is discharged, and provided the cap is within the appropriate range, I don't see any reason why it can't work in-circuit as compared to a dedicated ESR meter. As for protection, I wonder if a simple NC relay would suffice for some measure of protection? If the relay contacts were opened by the power-on sequence, they would discharge the cap on connecting the leads then effectively drop out of the circuit when the test button was pushed. Okay I will do that in a bit, don’t have caps with known ESR value but I will figure out something. Trying capture anything with a 4k storage was a real task, I could only capture in magnified sec/div at 5nS but the thing is this tester puts out different waveforms till it can measure and I could only capture the last one and the frequency of these are really odd. I think a DSO with proper storage could see a lot more. Maybe someone with a decent scope can help us? Hey Spawn, thanks a lot ! Yeah, that signal kinda weird and has unique pattern at the 1st test on open connection. And it looks like a square wave with quite slow rise/fall time to me ? Is it the scope speed limitation ? Anyone with high speed scope, please share the test signal please. Its cool to see it could measure your probe's input resistance at 1Meg ohm. 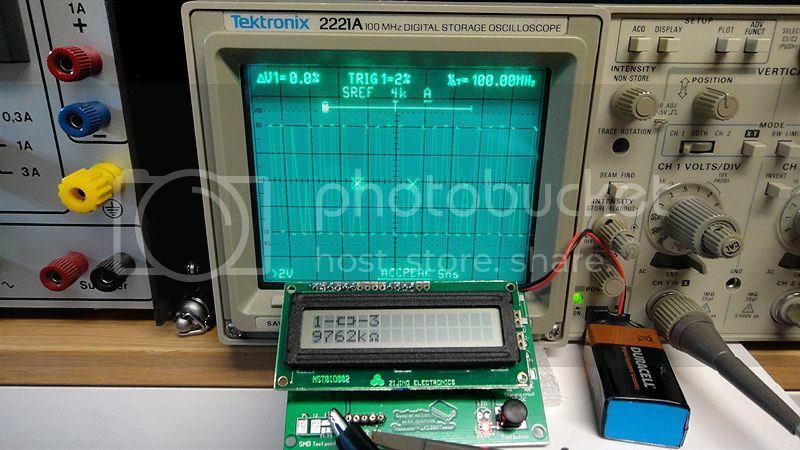 Looking at the test signal, at vertical about 2V, your scope shows the signal's Vpp is about 8.x Volt, and wonder if this high voltage could do harm on low voltage capacitor like 6.3 Volt or even those 2.5 or 1.8 volt expensive polymer caps ?